Earlier I created a video on passing stock market entries in Tally but that was from the point of view of business. If you are trading in stock markets or securities markets, that was the video for you from which you can learn to pass entries in Tally. But this video is for those who invest in stock markets. There is core difference between investment and trading. In this post I will let you know to pass entries in Tally, if you invest in stock or securities markets. This will also include basics for all kinds of transactions in stock markets such as futures, options as well as commodities. Before you go any further, here are some of the important things you need to keep in mind. I have checked the option Integrate Account and Inventory to NO. The reason for checking this option to No is simple. If we integrate accounts and inventory, the closing stock will appear in Profit and Loss account. But since it is our investment, it must be shown in the Balance Sheet and not in Profit and Loss account. Try by checking the option to YES and you will know what I am talking about. I have also created a group, three ledgers and a stock item. Group – Investment in Shares under Investments. Go to Gateway of Tally. You will option of Groups, press enter. You will see two options i.e. Single Group and Multiple Groups. 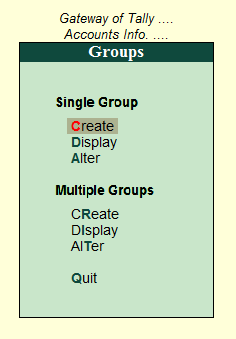 Now, if you want to create only one group, you can select Create under Single Group or else select Create under Multiple Groups if you want to create multiple groups. For example, you may invest in mutual funds, you can create a group of named Mutual Funds. Creating ledgers in Tally is pretty simple and easy. I have already explained about how to create ledgers in Tally in another post with a video. It acts as your stock broker whatever it may be like Zerodha, Jainam and so on. Share Brokerage under Capital Account because it is your investment it will be reflected under capital account and not in profit and loss account. It is the brokerage you will pay to your broker for investing in shares. I have kept it differently because at the end of the year, you need to know how much brokerage you have paid. You can also include all other charges as well as taxes that your broker charges you in the brokerage. But if you want to account for it separately, you create the ledgers for taxes as well charges in the same way as Share Brokerage under the Capital Account in Tally. Reliance under Investment in Shares which we earlier created. This is the share in which we are investing in this example. It can be any share or option or future or commodity you have or want to invest. I have also created a stock item named Reliance so I can have a record of how many shares I have, at what price I purchased those shares and what is the value per share. There is a big difference between Stock Item named Reliance and a ledger named Reliance. I have created Stock Item because I want to track the inwards and outwards of the stock. Also, by creating a stock item, you have the reports of profit margins and many other insights useful for taking business decisions. It is also very much easy to calculate capital gains once you have created stock item because Stock Summary shows you a particular date on which you bought and sold it. If you want to know how to create a Stock Item, please go and do read the earlier article I wrote for stock market entries in Tally. Now we will pass the main entry which I am talking about in this post. We will pass the Journal Entry because this entry neither involves cash or bank account. 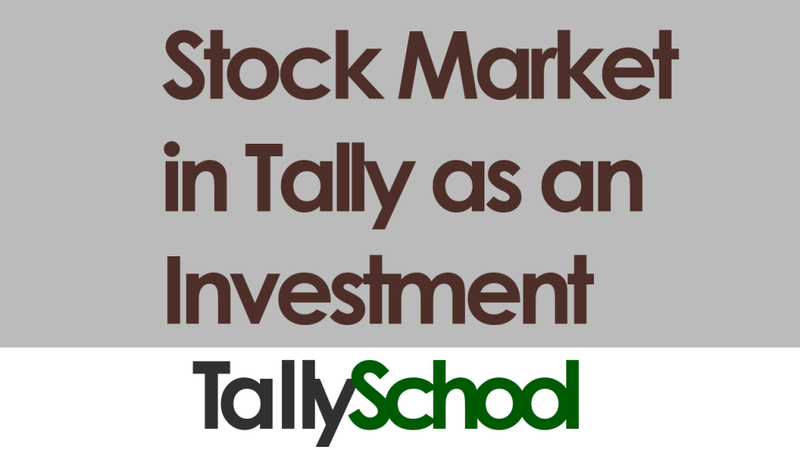 For passing a journal entry for stock investment in Tally, follow the steps. Then select Journal or just press F7. Now we will purchase Reliance share as we are making an investment in it. Select the Reliance ledger and you will the following in your Tally. 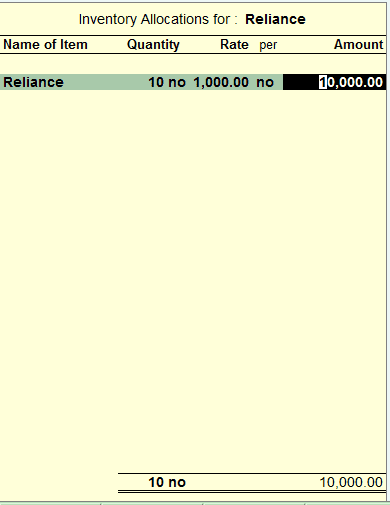 Enter the stock item named Reliance which we have created and enter the other details like Quantity and Amount. Tally will automatically calculate the rate. Now, let’s assume the brokerage is ₹100 for the above transaction of ₹10,000 so we have to pay in total ₹10,100 to the broker. We will select the Share Broker account and enter the amount of ₹10,100. And lastly we will select the Share Brokerage account and enter the amount of ₹100. Here is what the entry looks like in Tally. Save this entry by pressing Enter once again and you are good to go. Now let us have a look at the Balance Sheet and the effects of passing the entries. You can clearly see the Investment in Shares of ₹10,000. Now if you further go in, you will see the Reliance Share. Let’s look at the Stock Summary and see the details. You can go into the Stock Summary from the Gateway of Tally. You can easily have a look at the Inwards, Outwards as well as the Closing Balance of the stock. By studying this, you can also calculate the capital gains as I have said earlier. This is how you pass the entries for stock market investment in Tally. There are a few advantages of this technique also which I have listed down below. Most basic advantage of this technique is you can pass stock market entries in Tally as an investment also. Another advantage in Tally is that you can also compute capital gains in Tally year from year as per Income Tax Law. The advantage which I found useful is you can have all the details of stocks right from number of shares to cost per share you bought. This is amazing and it saves time too. The biggest advantage is that now you do not need to find another software or add-in to pass stock market entries if you are an investor. So that saves money too. In total this technique saves money and time both. Here is the video tutorial you are waiting for. Did you thought any other way of passing stock market entries in Tally as an investment? Which was it? You can create Stock Investment with units by going to the Inventory Info. and creating stock items. But, please note that the units will be available only in Stock Summary and not in the balance sheet. How do you account the various expenses in inventory like brokerage, ST, STT, SEBI chgs, Stamp Duty & Exch Trans Chgs. Well, you can do it both ways you like. If you like a detailed information, you can create separate ledgers for all of them and if you just like to have count on expenses you can create a ledger named “Share Brokerage and other charges” and add all the charges including brokerage and put them under Share Brokerage and other charges ledger. All the expenses goes under the head Direct Expenses if you are a trader and Capital Account if you are an investor. But what I suggest, you should put the expenses under a single account as I have said earlier. That would bring you enough clarity when you see accounts. Thanks for your reply. I am at present using only the Finance side in Tally, I want to know how to create stock entries in the Inventory side of Tally with all the expenses involved. I am an investor and maintain P&L too, all my personal transactions are recorded namely house, land, shares and bank. Please tell me how to pass entries in Inventory so that I can keep track of the shares I hold with their individual rates. Thanks & Regards. To have information about the stock of all the shares you have to create stock items. You can check out here about how to create stock items. I have written a detailed post about that. What If a person does intraday and investment trading? Should the Integrated option be Yes or No? And can you also show example video for sale of shares under Trading and Investment. Your videos are very simple and useful. The integrated option should be No, if you are investing and not trading. For intraday you just have to pass entries of net profit or loss. No shares included as you have already sold it. Now, you need to create ledgers of stock names under Investment. In there you have to show the closing balance of all the stock items. Can my books be maintained in such a way that stock price as shown in “Stock book” includes Share brokerage value. Do let me know in case there is such kind of solution. You just need to include the price including brokerage while creating the entry. Do not include brokerage in the brokerage account. Brokerage will be included in the capital account because it is an expense for having capital gain. Any expense incurred to create capital gain will have to be reduced from capital gain as per IT Act, 1961. While creating Stock under investment in shares , i am not getting an option for inventory will be affected. How to get that option? You have to edit the Stock Under Investment ledger. You have to enable Inventory Values are Affected to YES. It is up to you Sarthak! If you want it separately, you can mention it separately or otherwise with the purchase cost. You have to pass the exact opposite entry of purchase to pass an entry for selling the shares. Hi Rishit, Indeed it was helpful. However, from past few years in tally, investments were shown as stock as our accountant didn’t knew how to show it as investment. Now is there a way where all stocks can be transferred to investment a/c at once. We need to preserve purchase date and price since inception. Or do we need to pass individual entry for all share investment transaction. You can note the purchase dates for your preference. You can pass the entry for conversion of stock in trade into an investment for recording shares as investments. Hi Rishit, Indeed it was helpful. However, from past few years our accountant has been recording investment as stocks as he was unaware and we used to maintain BS and PL in excel to show it as investment. Now if we want to show it as investment from inception so purchase date and price can be retained, what we should do? Is there a way where it can be done at once or we need to modify each entry individually? I tried switching off the option of inventory but that does not help. You don’t need to switch off the inventory option in Tally. What you need to do is, you can create entries as I have explained in the tutorial in Tally from Excel. does the Tally work out first in and first out method of calculating capital gains/loss? Tally does calculate gains and losses by FIFO method. But it does not calculate whether the gain or loss is capital or revenue in nature. If i have done all entries through inventory. to show that as investment in balance Sheet you said create all items in investment for closing balance. If i continue further using method in video will it update my stock summary also ? You can manage stock entry and dispatch with the help of inventory info. and inventory vouchers. The entry for mutual funds is same as stock markets. how we can reflect the opening stock value of share and how to calculate the capital gain on if purchase cost and opening stock value of such shares are different. We calculate capital gains on the cost of purchase and not what value of that share is in the market. I hope your doubt got cleared. I have stocks lying with different DPs like SHCL, Karvy, Religare etc. Is there a way to generate statement of stocks lying with each DP to compare with the statements received from the DPs? I also have some physical shares purchased long ago and accounted, but not able to Demat now. how to handle such stocks in tally accounting now. I am telling you the easiest method for you separate stocks from different DPs. You can create a stock and name it along with DP. For example, Reliance with SHCL would be Reliance-SHCL. Reliance with Karvy would be Reliance Reliance-Karvy. stocks under different godowns each godown representing a DP. Do you see any problem with this arrangement? I split companies every march. how to segregate short term and long term capital gains in this scenario? does it help if I give batch number to each stock with the date of purchase? I don’t see any apparent problem. There are literally number of ways you can do a single thing in Tally and that is its beauty. In fact, it is amazing to know that something like this can even be done. Thanks for sharing your knowledge. To calculate the capital gains, you would need to see at the stock summary and check the inwards and outwards date wise using FIFO method. Batch number would help if you are used to it for calculating the gains. Other than that, I don’t see any use of batch numbers for stock markets. we need to CreateBoth Share Allotment & Share Premium under Share capital ??? This is a pure accounting question of 11th standard. You can find it on the internet. Share capital and Share Premium should be under Capital Account and not Share Capital since it is not Share Capital. You can do it by passing a zero valued entry in Tally. sir, can you please make a video on sale of shares as investment. Selling is almost similar to purchases except that you pass a sales entry. Please teach us how to pass Mutual Funds entries (Purchase and Sale) in tally. Mutual Funds entries are exactly same as Stock Market entries. I’ve tried different method for Mutual Fund Purchase entries and tell me weather this method is right or having flows and I am new to tally. Stock Categories are made as you have explained in tutorial. Now tell me can we use this method also? If not then what are the flaws this method is having? First of all, I truly appreciate your approach of trying differently. Not many people do it. Your method is also correct and there is nothing wrong in that. How to reflect Profit on Long Term / short term gain(Segregated way) in our pl account. Long Term and Short Term Gains are not reflected in Profit and Loss account as they are calculated only for the purpose of income tax. If it is your personal accounts and you are doing investment in shares, then it will be reflected in Balance Sheet. But even for balancing the books, I need to calculate Inventory value and separate relaised gains / losses from balance inventory. Say, in case, I purchased 100 units @ 1000, and sell 50 units @ 3000, in this case, the inventory will show a negative value of (-50,000), if the gain is not recorded in books. Any way that tally calculates the same on FIFO basis? Go to Stock Summary from Gateway of Tally. Then, press ALT+C and in there select the method of Stock Valuation as FIFO Perpetual. When I sell the shares / MF Units, how will I record the Gains? As we are not integrating Accounts and Inventory, gain / loss is not getting calculated automatically. How to calculate / record the same (FIFO basis as per Income Tax Act)? You can still calculate the gains by looking into the Stock Summary even if you are not integrating accounts and inventory. Then, you can pass the gains entry on the basis of the gains that you see in the Stock Summary. Why did you split the company? And, why did you transferred Closing Stock to Investment A/c? I want to show my stocks investments in balance sheet at last day. And all the year keep ainventory maintain so keep both for filing retain and maintain inventory by old continues accounting co so i have not to calculate every single stocks profit and adjustments. When ever want details can see profit and loss a/c with inventory. If any mistake by me please advise. Because i am new and using 7.2 tally. No, as long as you maintain the inventory and do the right entries, you are doing everything correctly. I have two questions regarding SIP . Since April I have been investing some amount in SIP . I want to know how to enter this amount of investment in Tally . Also please inform how to pay income tax on this profit . Or tax is to paid at the time of redemption only?? To enter the SIP investment entry in Tally, you will have to pass the following entry. SIP Account (under Investments) Dr.
Income Tax will only be levied when you sell the SIP or at the time of redemption. I will soon be publishing all the posts on the above topics with videos. Please wait a bit. Sorry for the delay. PLZ CLARIFY ME WITH DETAILS. There is no need to bring forward previous year details in Tally. You just need change the period from Gateway of Tally by pressing Alt+F2 to the next year and all the balances will be automatically carried forward. since long back, I am trying to use tally for share investment but could not manage inventory of share stocks in tally. Please guide me double entry for bonus shares issued by company. Second, when to use share purchase and share sales ledger. If i do the journal entry for both the purpose, will it affect inventory of share stocks. For bonus shares, you need to pass the entry as a zero valued entry. Secondly, if you use purchase and sales ledger for shares, it will show up in profit and loss account in Tally and if you want to invest in stock market, it should not be shown in the profit and loss account in Tally. Therefore, we use journal entries in Tally. You have given different articles for Investors & Traders. Please clarify to whom you consider Investor? If someone buy shares and sell next is a Investor or Trader ? And If one do both like mostly Investing and sometimes trading, which method should be opt ? I am not much into accounting so please don’t mind if the question is very basic. It is actually a very good question. Investor is the one who invests for generally a long time. Trader is the one who regularly trades in stock market is generally for a short time. There is no definition of investing and trading. It is the intent of the person. When you invest, it doesn’t show up in profit and loss account because you are not making profits but you are earning returns. While, when you trade, there is a profit or loss and it is shown in the profit and loss account because it is trading, just like any other trading activity. I have recently started using Tally. I have some investment in shares. I have opened separate ledgers for each transaction in a particular share to be able to track the purchase details. How do I make opening entries with qty & purchase dates and purchase rates for a particular item? Unfortunately, in Tally, there is no option of creating multiple opening entries as you are saying. I had this question from many people, there is no option right now in tally for that. You can maintain them in Excel and then take the amounts as per the purchase date as per FIFO. After one year or when your previous purchases are sold, you will have everything in tally and then you don’t have to worry about it.